Hard cider, when done right, can be as good as beer or wine. Better even. Think about what we’re working with here. Beer starts as starchy water. Wine starts as grape juice. Hard cider starts as apple juice. There are 7,000-plus apple varieties to choose from in various colors, shapes, and flavor profiles. Further, apples thrive across America. Cider was one of the most popular drinks in America from colonial times to the 20th century. In 1920, the 18th Amendment went into effect, Prohibition started, and cider was cast to the margins of drinking culture until the first half of this decade. Spring officially begins this week. Seems appropriate for our weekly Monday cider flight to lean on the fruity side. 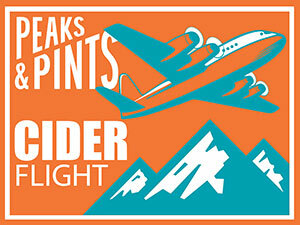 Enjoy Peaks and Pints Monday Cider Flight 3.18.19: Spring. 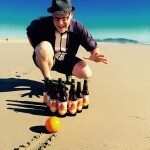 John and Tolena Thorburn adore craft beer. For 15 years they traveled the world drinking it. But, an oversaturated market lead them to cider. Learning and enjoying the varying styles and flavors unique to each brewer and set of ingredients, the Thorburns applied that experience to years of homebrewing and cidermaking. In 2017, Fierce County Cider launched its first commercial operating space in a 97-square foot ciderhouse in Puyallup. The ciderhouse is built for efficiency, utilizing the latest brewing technology and equipment to allow lead cidermaker Tolena to create “fiercely” ciders, including Mango. The nano cidery’s Mango cider blends the crispness of Washington apples with sweet mangoes for big juice flavor of Alphonso mango nectar without being overly sweet. From the outside, yellow and white peaches are distinguished by their skin color — deep yellow with a red or pink blush for the former versus pale and pink for the latter. Inside, the golden flesh of the yellow peach is more acidic, with a tartness that mellows as the peach ripens and softens. White-fleshed peaches are lower in acid and taste sweet whether firm or soft. White peaches also more delicate and easily bruised, which kept them from being sold in most stores until the 1980s, when hardier varieties were developed. According to Russ Parsons in How to Pick a Peach, older varieties of white peaches (and nectarines) had a bit of tang to balance the sugar, but the ones sold today are more uniformly sweet. Incline Cider Company’s white Peach is sweet, indeed, but not too sweet. Peach flavor does shines, though. In 2008, Craig Campbell and his wife, Sharon, began experimenting with making cider from dessert apples grown in their 400-acre commercial fruit orchards. Despite naysayers who warned that cider apples required a maritime climate, Craig also planted a two-acre test orchard with 25 varieties of cider apples. Today, their two-acre experiment expanded into Cider View, a 30-acre “high-density” cider orchard. 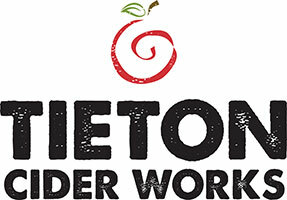 In their commercial cidery, Tieton Cider Works, they blend American heritage, English and French cider varietals with dessert apples to capture the best of what each variety brings to the bottle: sweetness, acidity, tannin and aroma. The results are ciders with body and a depth of finish, including Ashmead Kernel. 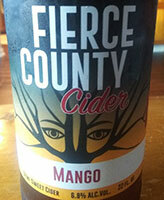 This cider is tart with pear character up front followed by deep Madeira and honey qualities to finish. Julie and Bret Pittsinger opened Karma Vineyards in the fall of 2007, creating the first traditional style champagne in Chelan County, Washington. As the brand grew the Pittsingers saw an opportunity to partner with his long-term relationships of apple growers in the area that he’s cultivated over several decades. The chemistry between the quality of apple and the knowledge of the traditional French champagne method, created a unique hard cider and Bad Granny Hard Cider was born. Pacific Northwest juicy Rainier cherries impart subtle notes of sweetness to this bright and perfectly balanced cider. 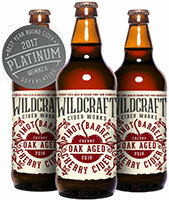 WildCraft Cider works grabbed “Best Year Round Cider” at the 2017 World Cider Champions for their Pinot Barrel Aged Cherry Cider. The award-winning cider is made from pure freeze-pressed cherry wine produced from a variety of Lane County cherries, aged five months in French oak Pinot Noir barrels. This wine is then blended with a naturally fermented, wild harvested cider for a full-bodied, high tannin complex cider. It hits the nose with cherry preserve, Pinot Noir, floral yeast, rose hip and rose petal. It’s slightly chewy with a crisp, effervescent, dry light body and a complex, medium-long taro custard, cherry skin, yeasty coffee cake, and herbal lozenge finish.